My name is Kirk Smith, and I am a 2001 graduate from Perry High School. I am writing today to show my support for the current bond issue. 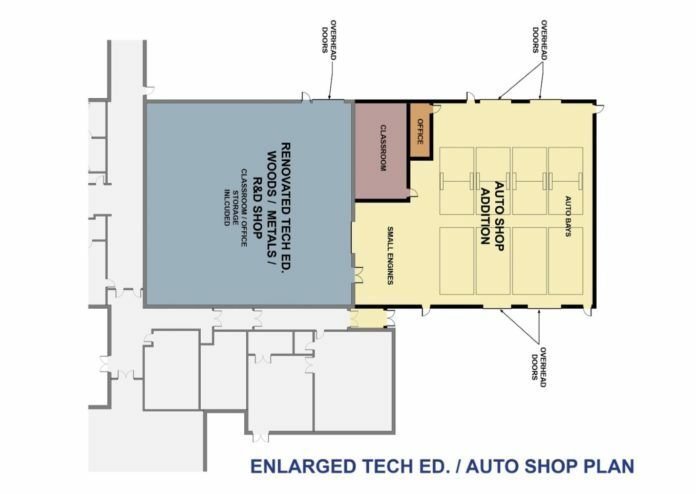 This will increase the automotive shop size at Perry High School as well as provide a more valuable education for its students. Throughout my time at Perry High School, the personal impact the auto program had on me is a large reason why I am where I am at today. Through the Research and Design courses, a great amount was learned about teamwork, dedication and perseverance, which is on top of the mechanical and technical knowledge gained. Through semesters of long nights at the shop, the students as a team built a record-setting car and claimed a state title. Without the auto program at Perry High School, many of these feats would not have been achievable. Being involved in the great clubs and groups within the industrial technology department gave me and others a home to grow that would not have been available in a traditional setting. Through automotive competitions, I had the opportunity to test my skills against the best automotive students across the state. This led to competitions with students from across the nation, in which I even managed to win a national title in the process. These opportunities pushed my knowledge and skills as well as built a foundation of working under pressure, teamwork, dedication, leadership and confidence in myself. I didn’t realize it then but looking back, these are the most important things I learned throughout my high school career. Perry High School has a rich tradition in the automotive program and consistently produces top competitors for the various competitions. The program also provides life skills that have progressed into well-established careers for many graduates. I feel proud to personally know many Perry graduates who have gone to be very successful in their careers within the trades. I’m sure if you ask them, most will point back to Perry’s outstanding industrial tech programs as an influence. The Perry High School Automotive Program built my foundation, which gave me the opportunity to go to college, pursue an automotive degree and become a leader in my field of electric vehicles. As a united front, we must continue the tradition for future students. Modernizing the industrial technology space is a critical step, as it will give Perry High School more of a foundation to better prepare its students for life after high school. Enhancing the education of students will provide a great sense of pride, especially from this Perry High School graduate. On Feb. 5 your vote matters, as it will assist the future students of Perry, Iowa. Kirk Smith, Director of Service, Chanje Energy Inc.